There are certain groups of witnesses who you would expect to be able to provide a ‘very good quality’ UFO report, for example professional pilots and astronomers, because of their familiarity with the sky and their technical expertise. The witness in this case, Peter Rogerson, falls into the latter category as a well experienced amateur astronomer. Peter is 66 and lives on the outskirts of Derby, where this observation took place. In his younger years, Peter was fascinated by astronomy, but in his teens the interest turned to electronics. Now retired, his interest in astronomy has re-emerged. He has been using his telescope to observe and image a range of astronomical objects including Venus, Mars, Jupiter and its Galilean moons, Saturn, the Moon, and sunspots during the autumn. Taking advantage of the long, dark winter nights and the early sunsets, Peter set up his telescope and camera about 5:20pm on the evening of 11th November 2018. His intention was to observe and image the star called Polaris B, the small companion star to the ‘Pole Star,’ Polaris. Many astronomers use telescopes on ‘Equatorial mounts’ that track the stars as the Earth turns, but these mounts typically make it difficult to observe the part of the sky near Polaris itself. To try and image Polaris B, Peter was using his telescope mount in a modified ‘Alt-Az’ set-up (i.e. the telescope tube could move in an up-down and left-right direction) which has the effect of making stars appear to drift across the telescope’s field of view as the Earth turns. Peter’s telescope is a Bresser 70mm diameter refractor of 700 mm focal length. The camera he uses is an Svbony SV105 digital electronic eyepiece, mounted at prime focus. Peter’s calibration indicated that at the camera’s sensor, 1 pixel was equal to 0.89 arc seconds on the sky, which is a very useful measurement to determine the size of the unusual object that he saw. Peter has provided BUFORA with two folders containing the 107 and 100 raw images (PNG files) that he captured of the mysterious object. Each sequence lasted about 6 seconds. The images are very small on these raw images, so are not reproduced in full here. However, a few cropped, but otherwise unprocessed, images are shown below. Peter has also run the images together to create two animated gifs. One of them is slowed down compared to how it appeared at the time, but the second animated gif shows the approximately ‘real time motion’ of the object. Animation 2 is quite illuminating. While the apparent ‘tumbling’ motion could be atmospheric blurring as seen through a small telescope, testing of the equipment would seem to rule this out. Tests taken of similar brightness stars show that Peter’s telescope and camera are working perfectly: Stars are small, round and bright, and do not show any of the detail that these images of the ‘tumbling skull’ reveal. Hence, our conclusion is that this sighting is of a genuine extended object and the tumbling effect is caused by a genuine motion (a fast rotation or possibly a chaotic tumbling) of the object. The changes in appearance from one frame to the next would suggest the object was spinning or tumbling rapidly, which you certainly wouldn’t expect from an aircraft or normal satellite. While my initial thought was that this was some space debris, perhaps a rocket booster or a defunct satellite, or possibly a passing irregularly shaped asteroid, the motion of the object made me think twice about this explanation. I had already checked to see what satellites and space debris might be visible in this part of the sky and found no suitable candidates. 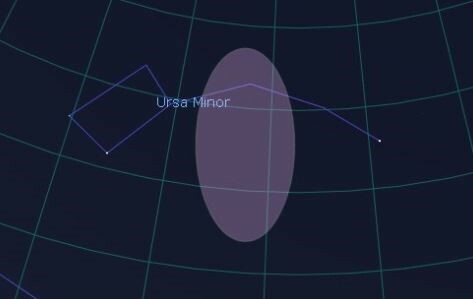 Based on precise measurements of the vertical and horizontal drift in these images, we can determine that the object should have been close to the star 5 Ursae Minoris (RA 14h 27m 31.5s, Dec +75 degrees 41m 45.6s). If the object was a satellite, space rock or debris, then its orbital motion would be significant and it would be difficult to track with a telescope. In Peter’s alt-az configuration, an object like this would have whizzed across and out of the field of view in less than a second. If the object was close enough to show this amount of detail in the telescope, then it must have been relatively close and therefore moving quite rapidly as seen from the ground - unless we have the very unlikely situation that it was headed precisely towards the witness. 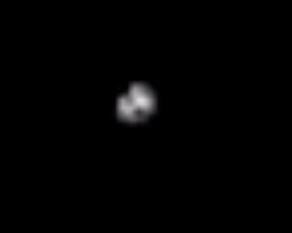 The lack of motion across the sky would suggest that the object was extremely distant, i.e. astronomical in nature. However, its apparent tumbling motion is unlike anything that could typically be seen through a telescope. I have checked for deep sky objects (e.g. planetary nebulae) in this part of the sky that might, with atmospheric turbulence, give this appearance but again I have found no suitable candidates. 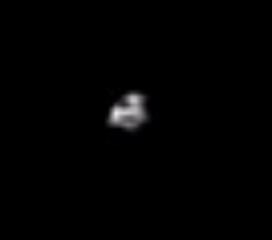 To recap, we have a knowledgeable and technically capable witness who has captured a small image of a rotating/tumbling object. * The witness’s equipment appears to be working perfectly and this object is not an image of a star seen through atmospheric turbulence or some effect of the telescope and/or camera. * The lack of motion across the sky would suggest that the object was astronomical in nature, but no suitable non-stellar objects are visible in this part of the sky. * Non-astronomical candidates such as satellites, space debris, or an earth-crossing asteroid would move rapidly across the field of view, which is not the case here. * The same argument applies for aeroplanes, helicopters or weather balloons as one would expect their relative motion, magnified through the telescope, would rapidly take them out of the field of view. * The angular size on the images indicates that a smaller object such as a Chinese lantern or a drone would need to be at an altitude of approximately 10 km, which seems well beyond their normal range. * The object has not been seen since, and no other observations from other witnesses have been received to my knowledge. So we appear to have run out of easy and obvious solutions to this particular sighting. Any suggestions from readers would be appreciated.